Toronto Real Estate Blog - GTA News : Wonderful Davenport House For Sale !! • 3 bath, 3 bdrm single story - MLS® $700,000 - Elegant Semi! Davenport/Dufferin, Toronto - Welcome To 126 Beaver Terrace! This Is A Stunning, Immaculate, Large And Solid All Brick House Located In A Popular Well-Established Neighbourhood! This Semi-Detached Was Built In 1986 And Includes A Built-In Garage With Walk-In, Private Drive, 4 Year Old Roof, And 2006 Thermal Windows! 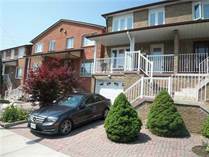 It Is Just Steps to The TTC, Just A Walk To The Mall, Restaurants, And Other Amenities! The Living And Dining Are Combined With An Open Concept With Parquet Flooring! The Dining Room Features Crown Moulding; These Two Rooms Together Make For An Ideal Space For Family And Friend Gatherings! The Eat-In Kitchen Is Spacious And Includes Granite Countertops, Gas Stove, Fridge And A Built-In Dishwasher! It Also Has A Large Door Opening Up To The Deck! This Will Bring In Lots Of Light During Breakfast In The Mornings! It Includes 4 Bedrooms Of Good Size, Perfect For Everyone In The Family To Have Their Own Bedroom! Other Extras Include: Basement With 2 Separate Entrances, Fireplace, Gas Furnace & Equipment, Central Air Conditioning & Equipment, Dryer, All Window Coverings, All Electric Light Fixtures! Where Will You Be in Five Years -- Hopefully Closer to Being Mortgage FREE - Build Equity - Sell and Move into a Bigger Home. Home Ownership Could Be Better than An RSP! Welcome To 126 Beaver Terrace! This Is A Stunning, Immaculate, Large And Solid All Brick House Located In A Popular Well-Established Neighbourhood! This Semi-Detached Was Built In 1986 And Includes A Built-In Garage With Walk-In, Private Drive, 4 Year Old Roof, And 2006 Thermal Windows!